Chances are you've seen plenty of videos of horses and riders conquering tall fences together, but in truth, horses don't need riders in order to jump fences. 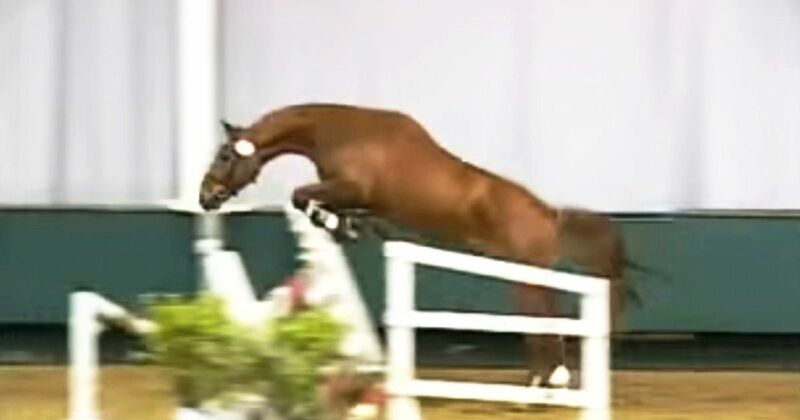 This video shows a talented horse free jumping over progressively higher fences. The horse is balanced, moving naturally, and demonstrates beautiful form over the fences. Free jumping refers to setting a horse up to jump fences on his own. Usually, horse owners set up jumping chutes which run down one side of the arena to direct the horse toward the fence, keeping him from running out around the side of the fence. There are many benefits to free jumping for horses. According to Equine Wellness, free jumping can be a useful tool for developing a horse's confidence and balance, since the horse must learn how to use himself over fences. However, it's very important that you properly set your horse up for free jumping. It may be tempting to ask your horse to jump higher and higher fences, but asking too much of your horse too soon can risk physical injury and may damage his confidence. Remember that jumping is strenuous on a horse; keep jumping sessions short and give your horse plenty of time for recovery between sessions. You may want to put leg boots on your horse for added protection, and only ask him to jump in safe footing. Some breed registries require that a horse be free jumped to assess their talent. This free jumping assessment is used when horses are young and aren't yet broken to saddle, but free jumping also allows us to see the horse's natural talent without the influence of a rider. There are many reasons to free jump a horse, but if you're going to give this practice a try, make sure you have an experienced equestrian to show you how to properly free jump your horse.